[Santa Cruz, CA, APRIL 1, 2019] – Step aside, coffee pods. Take a rest, instant coffee. There’s finally a single-serve option available in the world of high-end coffee, and it’s quickly becoming a game changer. Steeped Coffee is the most convenient way to make a cup of delicious coffee. Steeped, Inc., based in Santa Cruz, California, is a B-Corp (Benefit Corporation) focused on Purpose Beyond Profits. They strive to innovate and find new solutions to old problems, to be a light on a hill, to honor and value every relationship, and to set new standards of doing business without compromise. 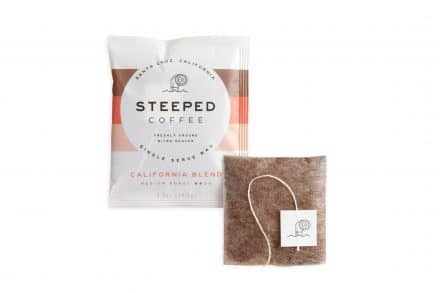 Steeped is focused on every detail from farm to cup and beyond, to bring people the most convenient, quality, ethically sourced, and sustainably packaged products available. For more information, visit http://www.steepedcoffee.com. For business inquiries, contact sales@steepedcoffee.com. Look for STEEPED COFFEE at the Specialty Coffee Expo, April 11-14, 2019, Boston, MASS, Booth 154.